Couture wedding decorations are essential for modern couples looking to create their unique once-in-a-lifetime wedding experience. Just like wedding gowns and suits, our bespoke wedding decorations can be customised to flaunt your personality. Whether you are the minimalist bride or the flamboyant groom, our wedding decorators will style your wedding decor tastefully to set the perfect ambience on your special day. Symbolising the future home of the bride and groom, an exquisite wedding arch has been a hallmark of some of the most beautiful and romantic weddings. Their elegance has transcended from the big screen to reality. With the increasing demand for wedding arch rental in Singapore, we have launched a brand new range of customised wedding arches. Featuring a stylish blend of flowers, balloons, glitter confetti, fairy lights and modern calligraphy, you can now appreciate its ethereal qualities and have your vows said under your very own beautiful wedding arch! 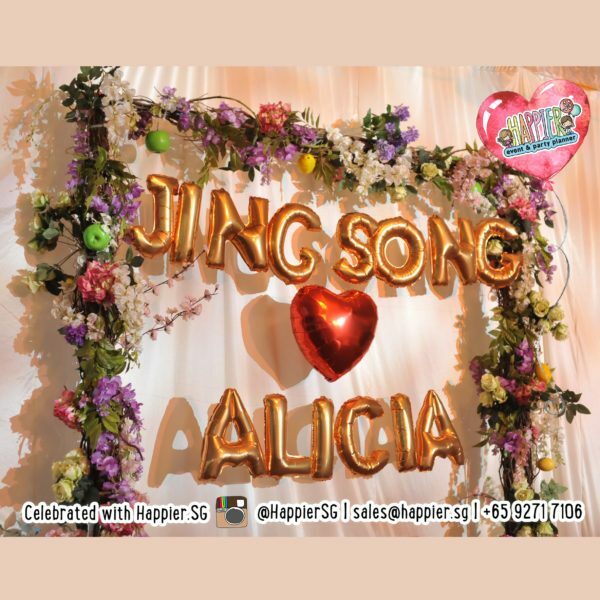 Make your wedding a grand affair with our stage decorations! An eye-catching wedding stage will captivate your guests throughout the entire wedding ceremony. 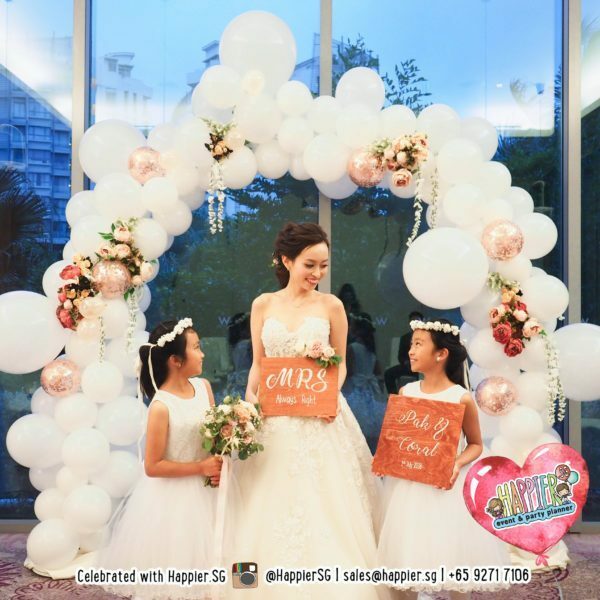 Featuring beautiful flowers and personalised ornate decorations, our wedding stylists will help you create a perfect and memorable wedding in Singapore. 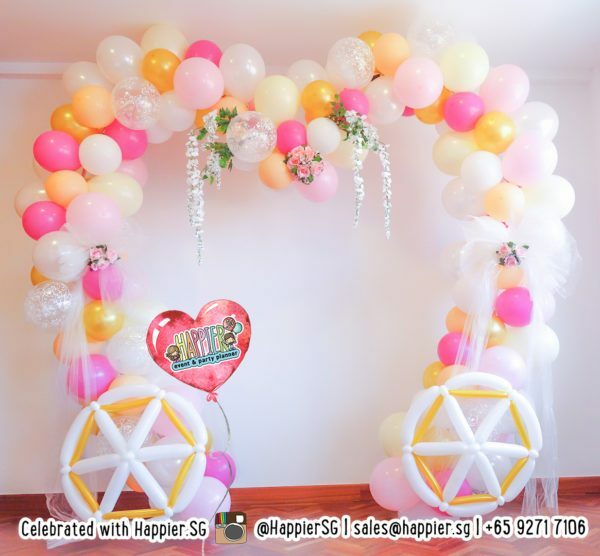 At Happier, we are committed to giving you the best experience when you plan your wedding decoration with us. 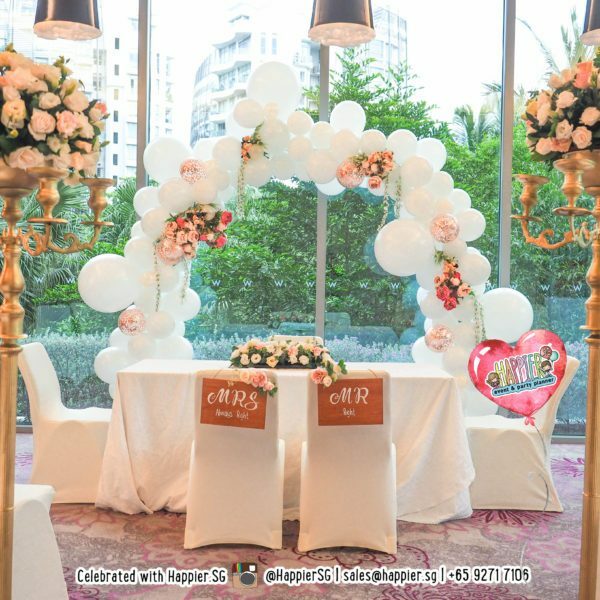 If you are uncertain about where to start on your wedding decoration, our wedding decoration packages will give you the flexibility to explore all the possibilities within a comfortable price point. We understand the need for every wedding to be perfect! For such a grand occasion that happens once in your lifetime, the right wedding decor is crucial to complement your venue and set the tone for the entire wedding ceremony. We strive to ensure every aspect of your wedding is taken care of to perfection. We are committed in helping you design your dream wedding decoration and give you a peace of mind to enjoy your big day. Our wedding stylists will provide you with plenty of ideas, from vine-covered arches to elaborate balloon sculptures of the bride and groom. 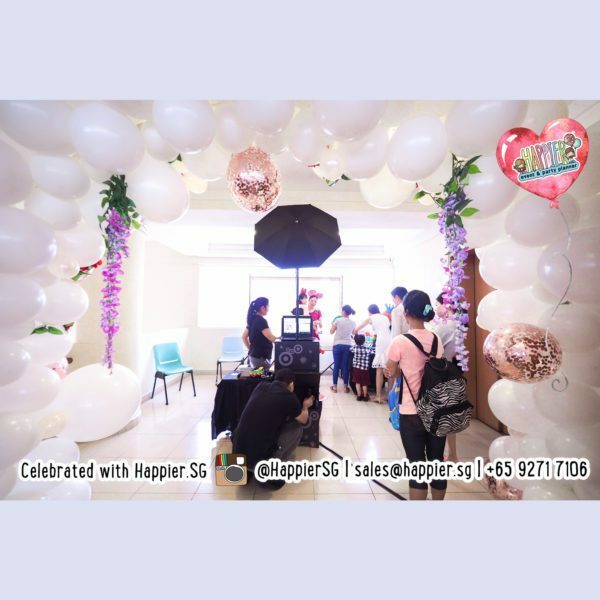 More than just adornments to elevate your wedding venue, designer wedding decorations can create unforgettable photo opportunities for you and your guests. 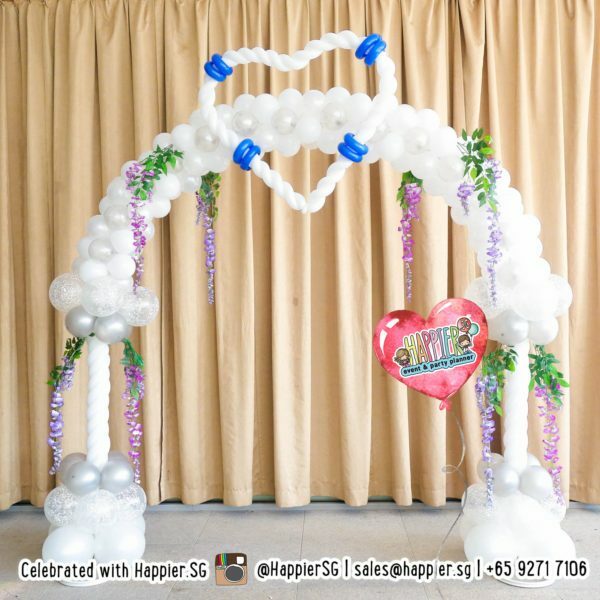 Wedding balloon decorations add a splash of festivity and colour to wedding ceremonies, a reminder that it is still a day for celebrations. 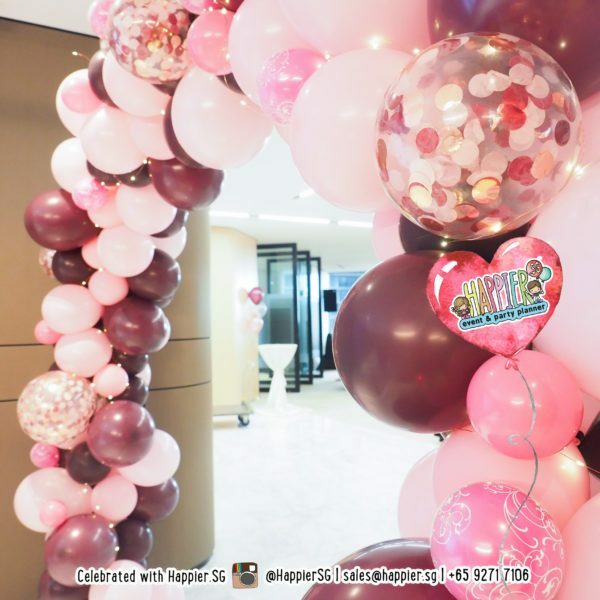 Balloons aren’t just child’s play! 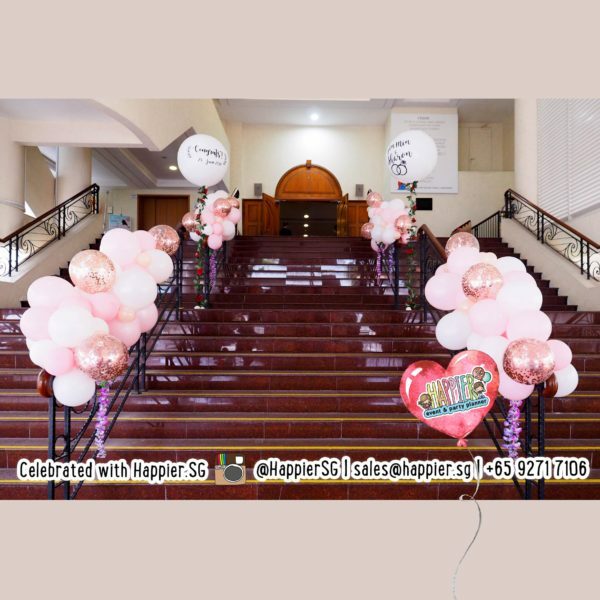 When mixed in the right tones, textures and assymmetrical sizes, balloons bring a creative and artistic flair to your elegant wedding. Giving you access to a wider colour palette of champagne & peachy hues, as well as interesting textures like glittery confetti and marbled effects, otherwise hard to achieve with just flowers alone. 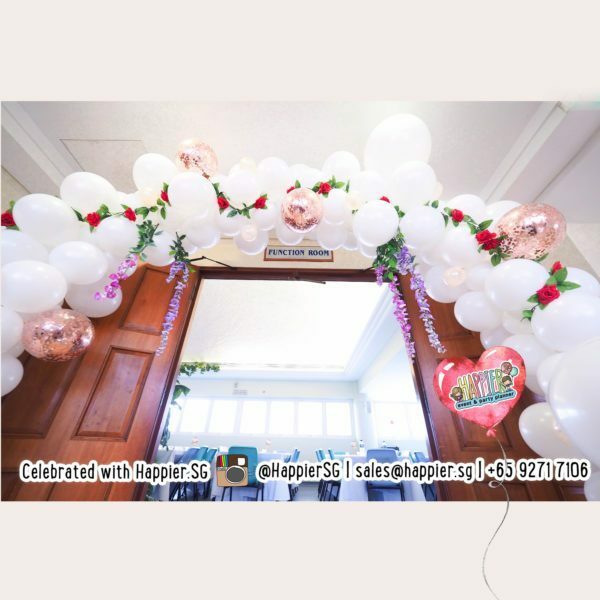 At Happier, we listen to your ideas and use them to guide our decisions in planning and executing the best wedding decorations possible. We always work with your happiness as our top priority, giving you the chance to enjoy this experience of a lifetime.